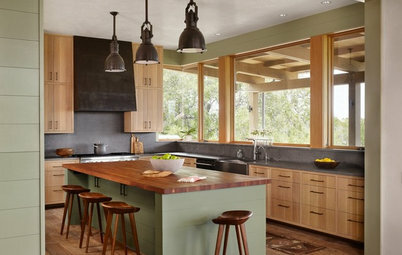 Houzz Editorial Staff; writer, design enthusiast, reader, avid traveler. 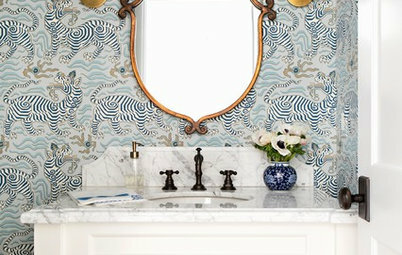 The powder room has long been a favorite space for designers to transform into a jewel box. 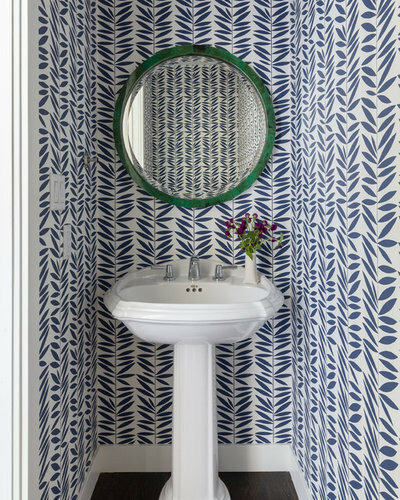 Whether with bold wallpaper, an innovative sink or sensational lighting, the designers of these powder rooms were willing to throw caution to the wind to create a knockout space that pleases the eye. Explore these 50 powder rooms from around the world and let us know in the Comments which one is perfect for you. 1. 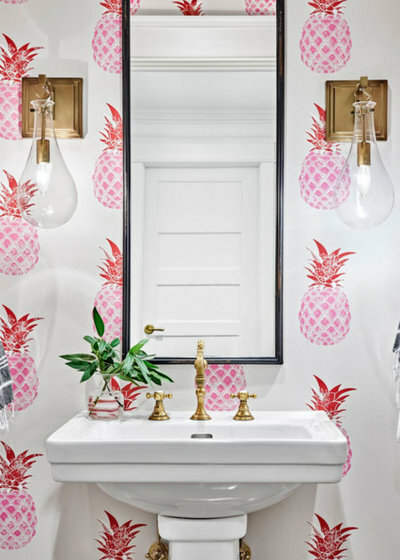 McKeithan Design Studio used bold pineapple-inspired wallpaper to make a splash in this Nashville, Tennessee, powder room. 2. 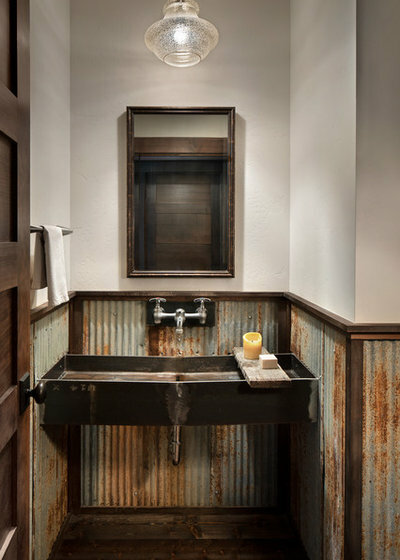 A salvaged metal sink and corrugated metal walls add rustic appeal to this Montana powder room built by Denman Construction. 3. 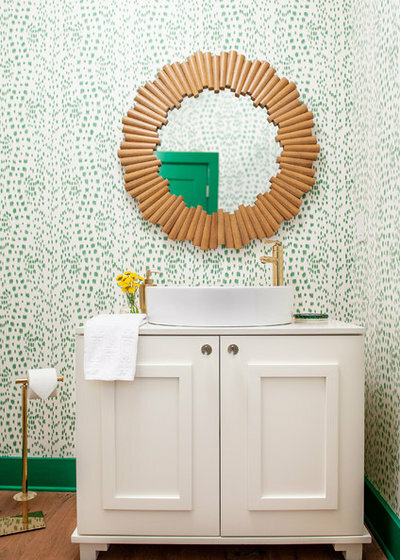 A round malachite mirror and whimsical wallpaper bring visual appeal to this San Francisco powder room designed by Kimberley Harrison Interiors. 4. 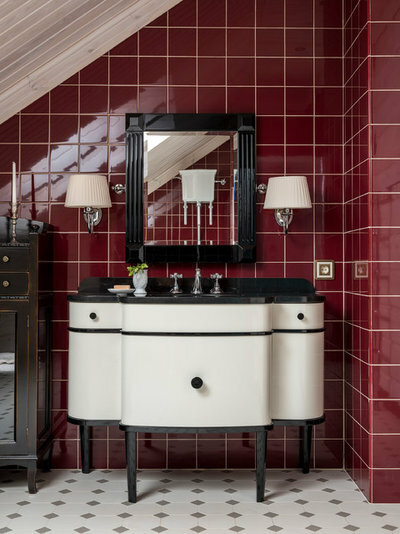 This Art Deco-inspired powder room in Moscow was designed by Natalya Vasilyeva. The space features a custom black-and-white vanity with a curvy silhouette. 5. 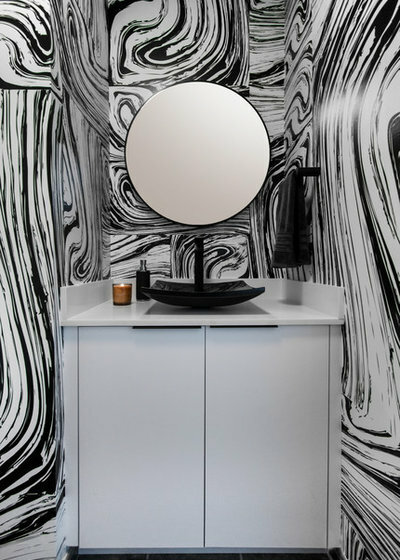 While this Miami powder room has a stark black-and-white color palette, it would be hard to describe the energetic space as minimalist. 6. M.S. 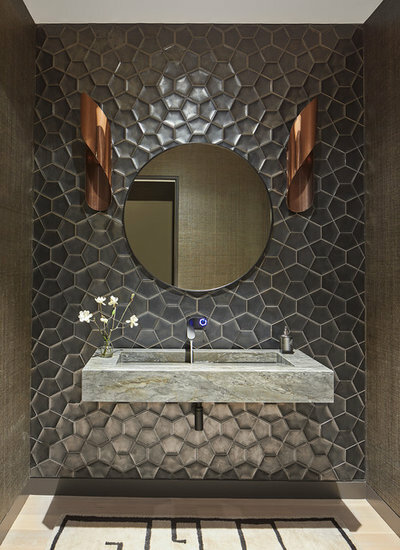 Vicas Interiors combined the textures of the abstract tiled walls, stone floating vanity and copper sconces to make a stunning Washington, D.C., powder room. 7. 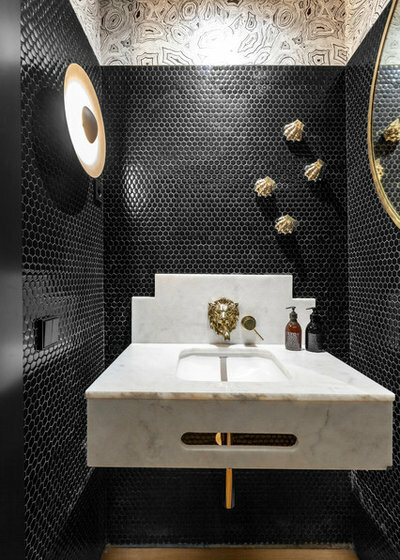 This sophisticated powder room in Spain features black penny tile-covered walls and a marble vanity with a gold faucet that looks like a lion’s head. 8. 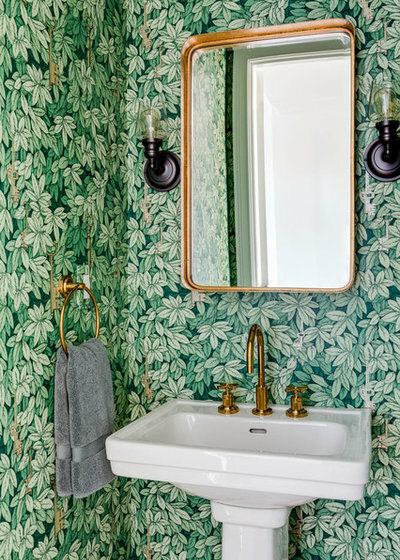 Look closely at the wallpaper in this Boston powder room designed by Eleven Interiors and you will see brass keys hidden among the leaves. The brass in the wallpaper is picked up by the brass fixtures and hardware. 9. 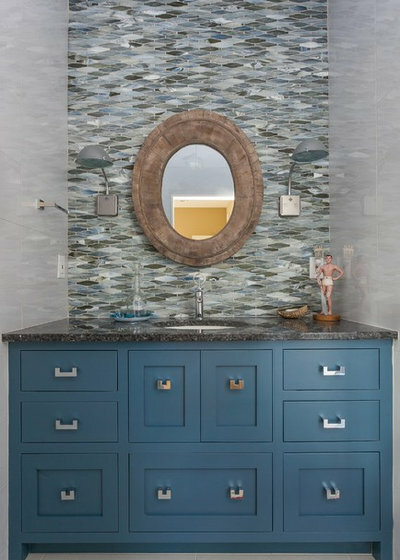 The floating vanity with lights mounted underneath helps keep this stylish Minneapolis powder room by Lucy Interior Design from feeling too heavy. 10. 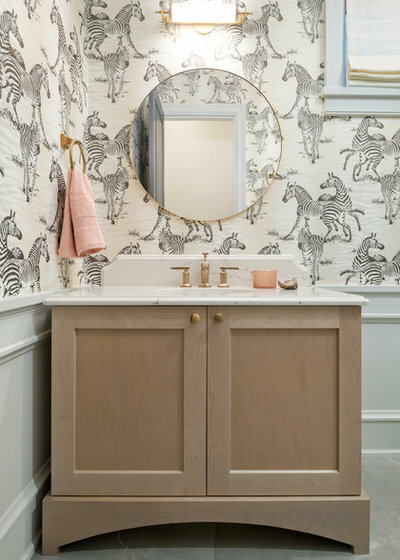 Wallpaper featuring playful zebras, a light wood custom vanity and gray marble floors are among the highlights of this Vancouver powder room designed by Magpie Interiors. 11. 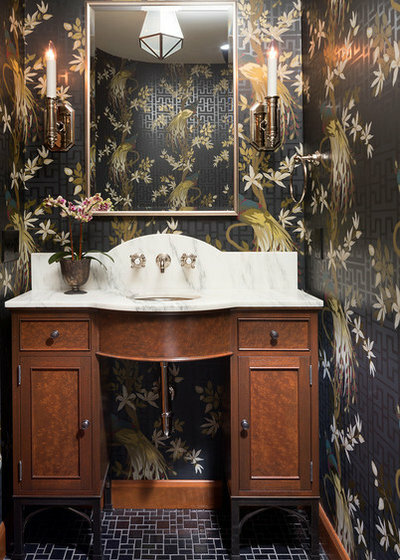 A custom vanity featuring stained wood and a marble top is paired with a moody floral wallpaper to create a classic powder room in a Minneapolis Tudor home. 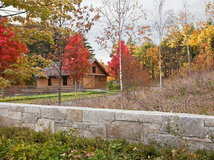 The space was designed by Rehkamp Larson Architects. 12. 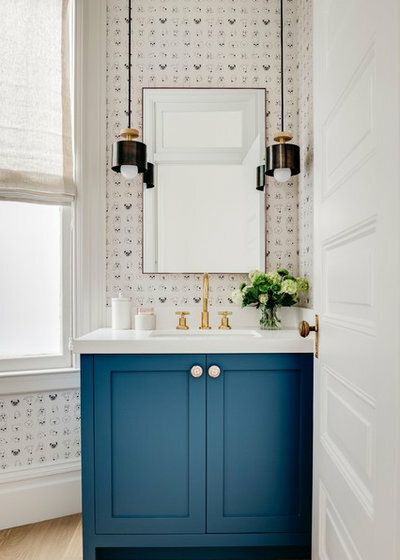 A dresser-turned-vanity, fun wallpaper and a mirror with a cork frame add to the magic of this Nashville, Tennessee, powder room by Andria Fromm Interiors. 13. 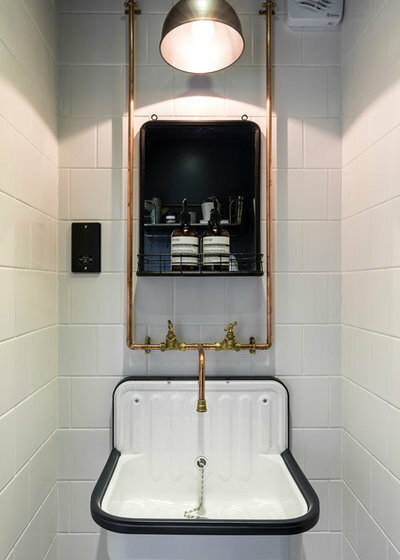 Exposed pipes and a salvaged sink make for a hip industrial London powder room, designed by Canham & Hart. 14. 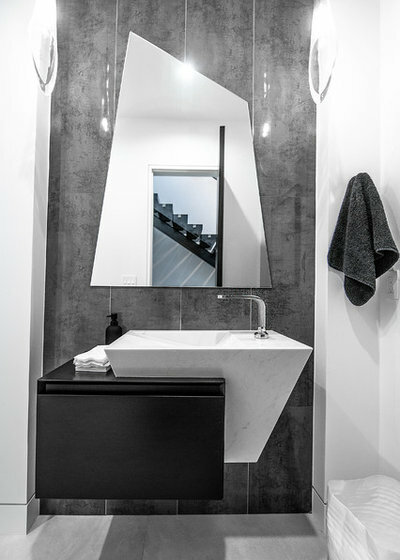 The design team at Pedini Los Angeles had the wall mirror cut into a trapezoid to mimic the shape of the vanity in this stylish Los Angeles powder room. 15. 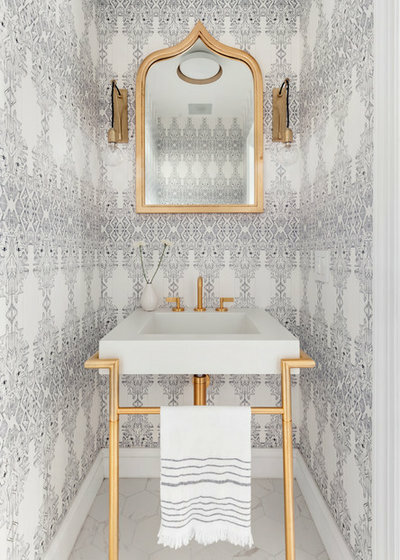 The wallpaper, towel and gold mirror create a Moroccan vibe in this trendy Manhattan powder room. 16. 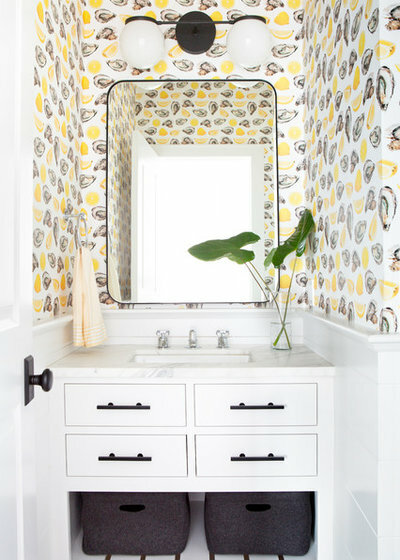 Designer Denise Morrison used a whitewashed mirror, blue wallpaper and gray-washed oak vanity to help create this beach-inspired powder room in Orange County, California. 17. 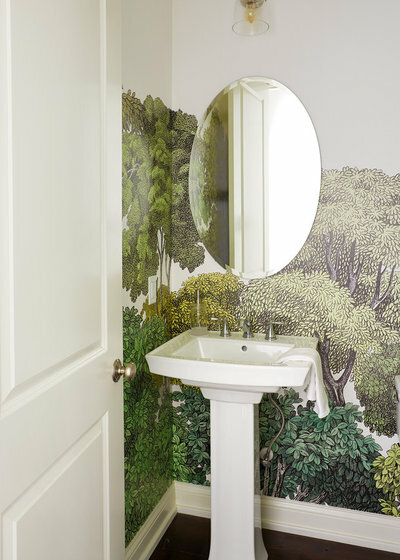 A woodsy wall mural makes the perfect backdrop for this understated and elegant Nashville, Tennessee, powder room designed by Marcelle Guilbeau. 18. 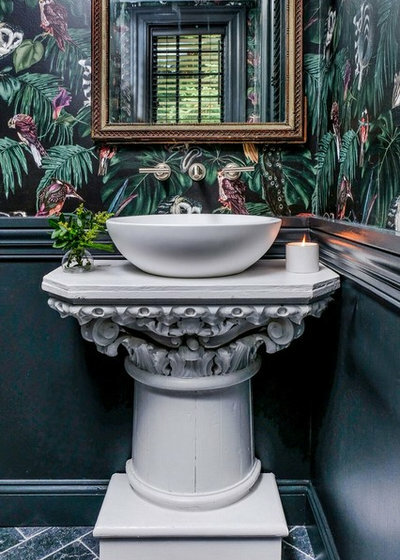 This dark and moody Los Angeles powder room designed by JAC Interiors has some glam rock-star appeal with its sleek black tiled walls, floating marble vanity and funky accessories. 19. 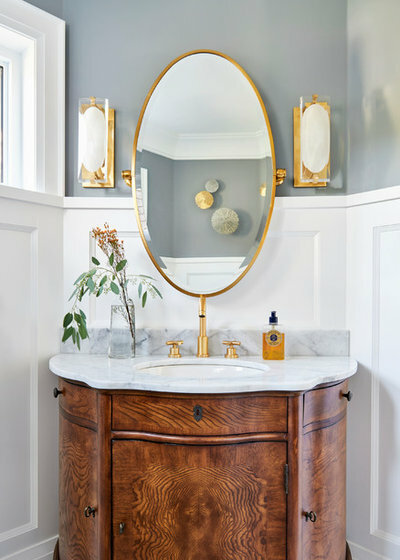 The wainscoting, brass sconces and antique dresser transformed into a vanity create an elegant powder room in Toronto, by Diana Bastone Designs. 20. 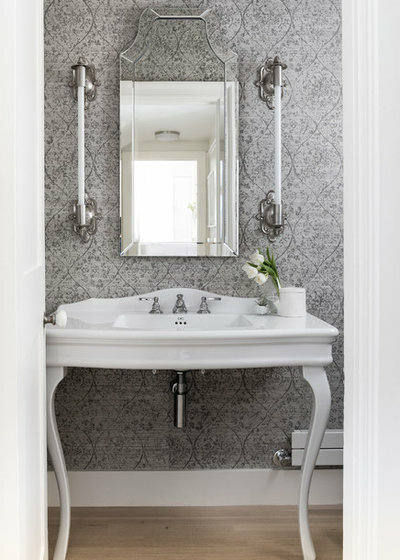 Located in a former church in England, this powder room designed by Etons of Bath keeps a sense of historic character with its vintage-inspired wallpaper and Industrial Age-style sink. 21. 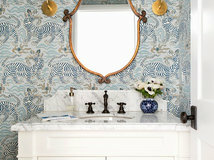 C. Kramer Interiors added a lot of nice design touches to make this Connecticut powder room shine. 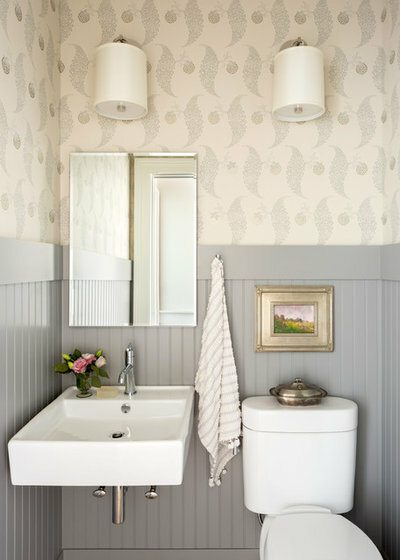 Note the gray painted wainscoting, the linen wall sconces and the perfectly sized painting above the loo. 22. 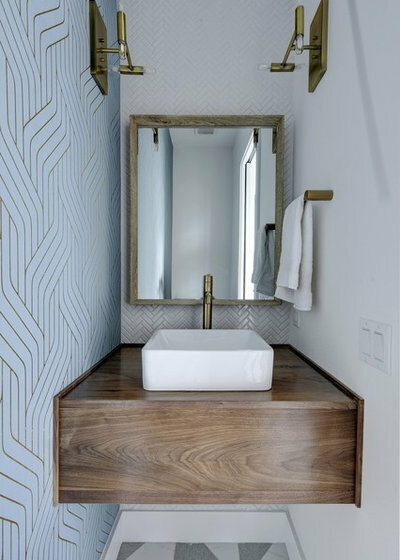 This stylish Sacramento, California, powder room built by Jim Morrison Construction features an abstract tree-inspired wallpaper, exposed brass plumbing and fixtures, and a custom concrete vanity top. 23. 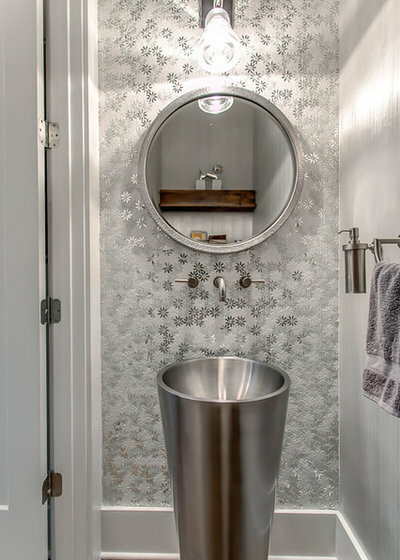 Duet Design Group cleverly hung a mirror in front of the window in this Denver powder room. 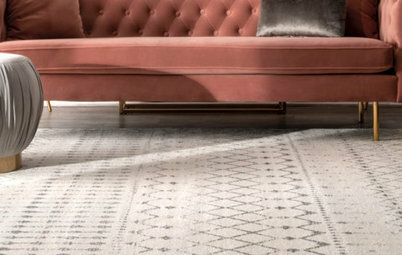 A floor-to-ceiling linen curtain filters the natural light in this elegant space. 24. 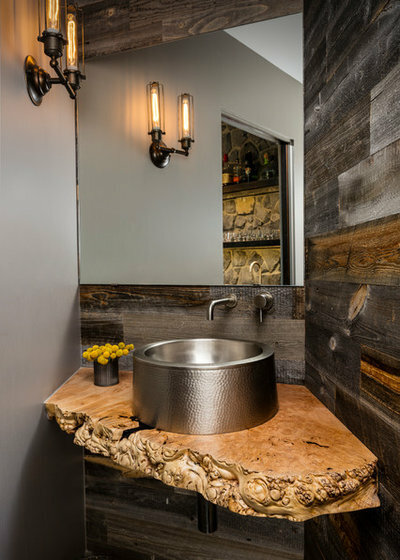 A slab of live-edge oak makes for a dramatic vanity base in this Seattle powder room by Paul Moon Design. The vessel sink atop the base is made of hammered metal. 25. 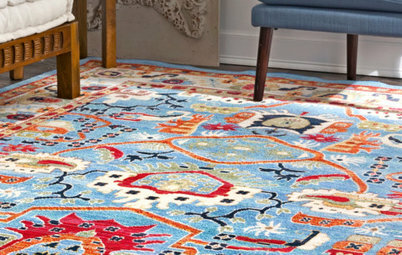 Lucy Interior Design hand-painted the wood floors in this eclectic Minneapolis powder room to make them look like tile. The bold wallpaper adds another splash of whimsy. 26. 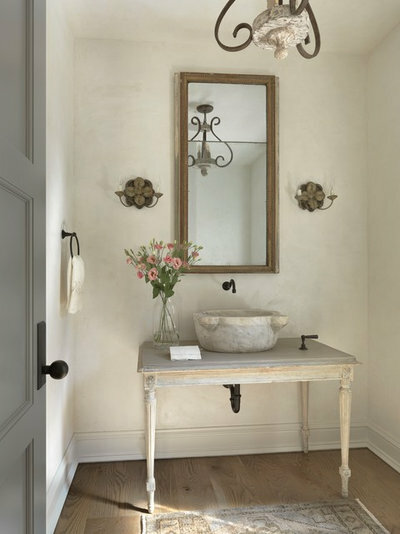 This Zen-like powder room in South Carolina was built by Dillard-Jones Builders. It features a dark bronze vessel that has been transformed into a sink. 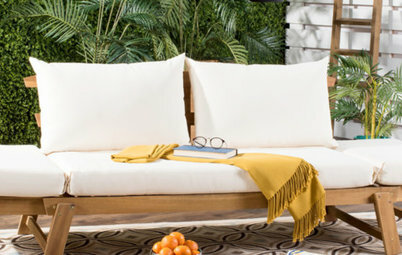 The vanity base is made of reclaimed wood. 27. 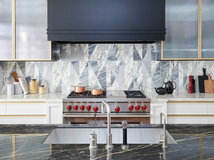 Ventura Custom Homes hung a Dimond Home Shiverpeak mirror with a frame of natural rock crystals on a black lacquered wall here, to glamorous effect. 28. 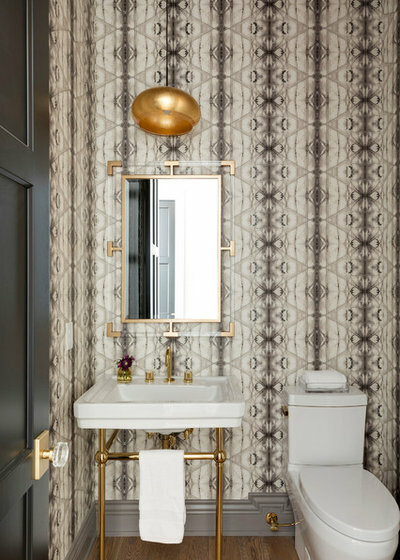 An abstract wallpaper, a gilded pendant light and a sink with brass legs are among the stars of this Minneapolis powder room designed by Kroiss Development. 29. 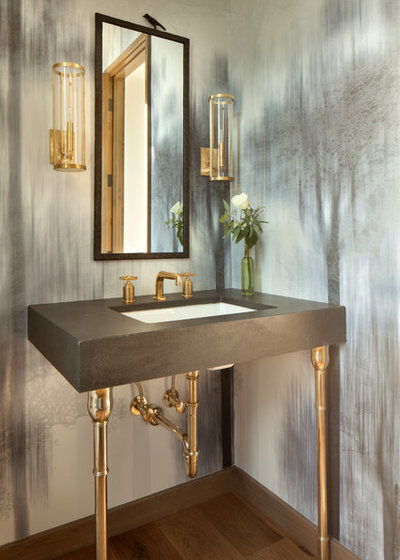 Melisa Clement Designs made the most of this small Austin, Texas, powder room by adding a floating walnut vanity and hanging brass sconces above it on two sides. 30. 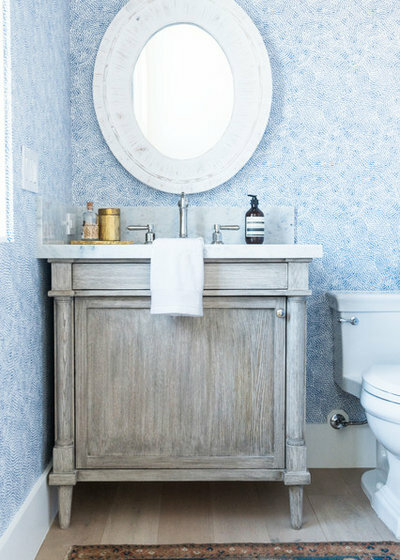 This powder room is on an island off the coast of South Carolina, so the homeowners wanted to infuse it with some coastal charm, including with a bright blue vanity and a driftwood mirror. The space was built by the team at Phillip Smith General Contractor. 31. 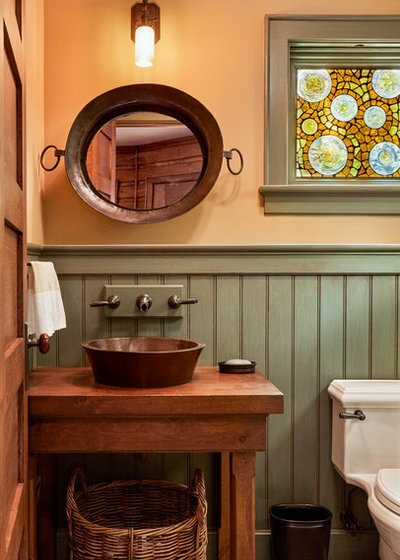 This rustic powder room in Burlington, Vermont, was designed by Ann Stillman O’Leary. 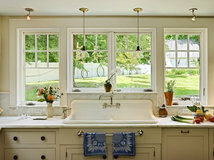 It features a mirror made out of an old pan and a vanity made from an old dresser topped with a copper vessel sink. 32. 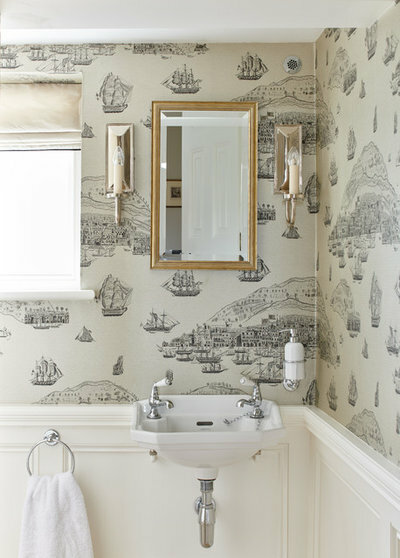 This nautical-theme powder room in Westchester, New York, was designed by the M&P Design Group. 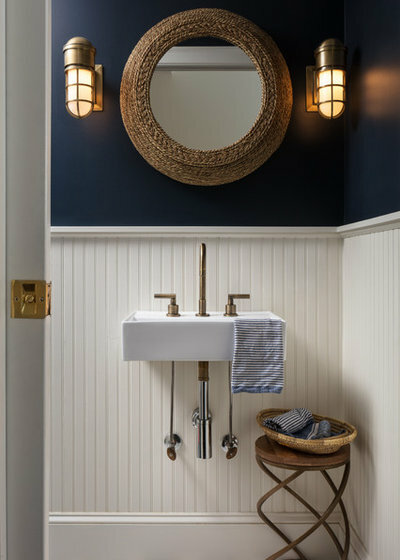 It features nautical sconce lights, a rope mirror and dark navy painted walls. 33. 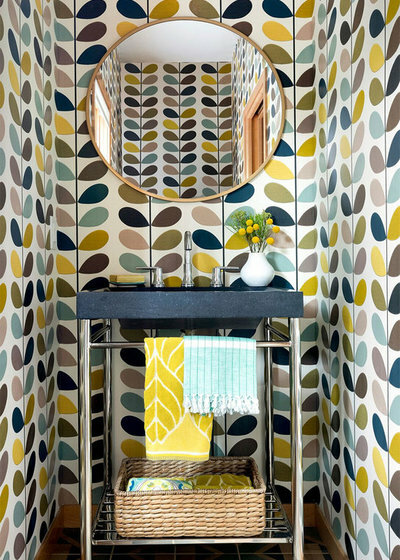 The multihued stone vanity in this Denver powder room by Emily Tucker Design is a stunner. Lovely blue-green painted walls add another layer of interest. 34. 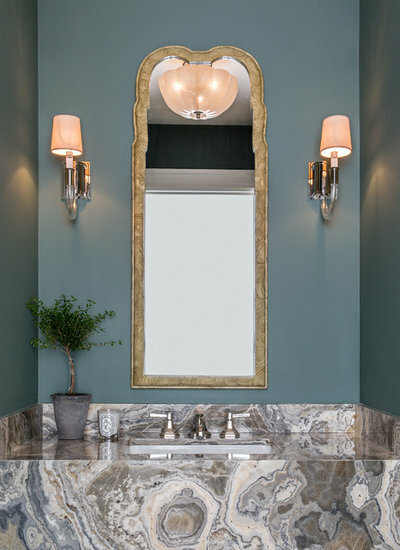 The wall sconces in this Seattle powder room designed by DeForest Architects are a great mixture of classic and contemporary styles, with their ornate nickel elements and sleek light tubes. 35. This Palm Beach, Florida, powder room built by Beacon Construction Group features a slab of marble attached to the back wall. 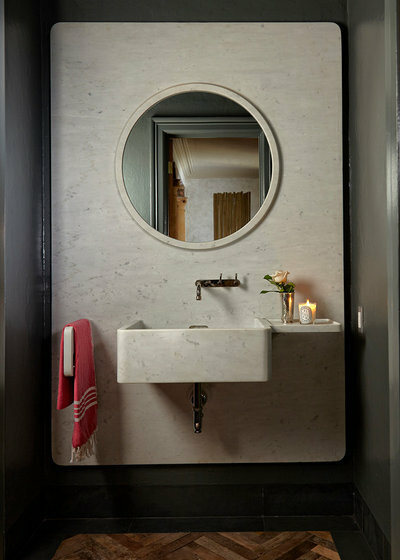 A round mirror is recessed into the wall, and the vanity is made of the same marble, creating a unified look. 36. 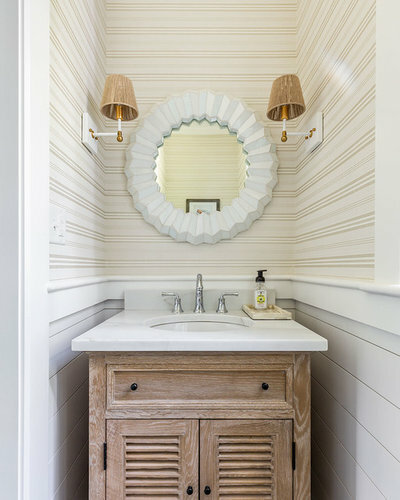 Plaster walls and a vanity that combines distressed wood and a stone vessel sink add Shabby Chic-style touches to this St. Louis powder room by Amy Studebaker Design. 37. 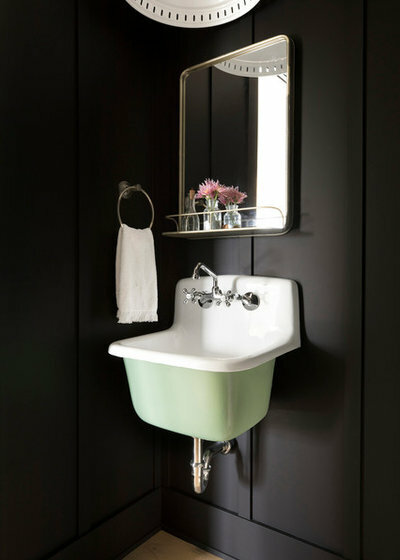 A vintage porcelain sink received a coat of mint-colored paint to make it pop against the black walls in this Minneapolis powder room by Sustainable Nine Design + Build. 38. 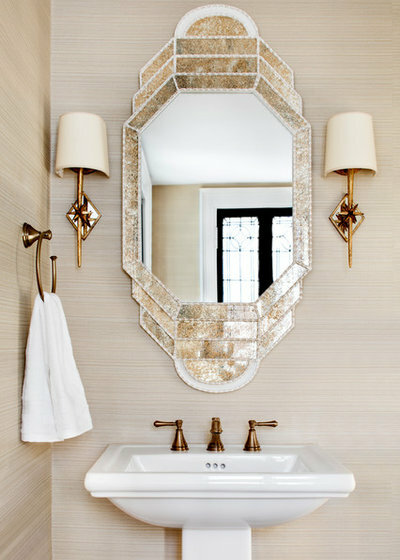 A beige-and-brass palette makes for a serene yet sophisticated powder room in Baltimore. 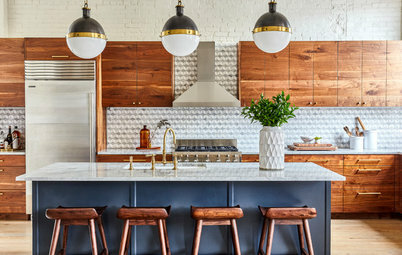 This stylish space was created by designer Stephanie Bradshaw. 39. 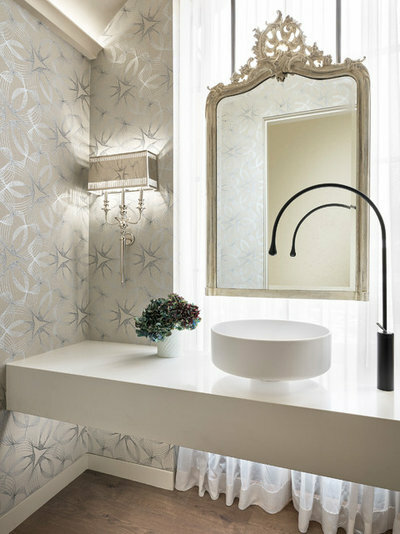 A large stainless steel vessel sink, a stainless steel soap dispenser hung on the wall and a round stainless steel mirror work well together in this Orange County, California, powder room by Design Design Interiors. 40. 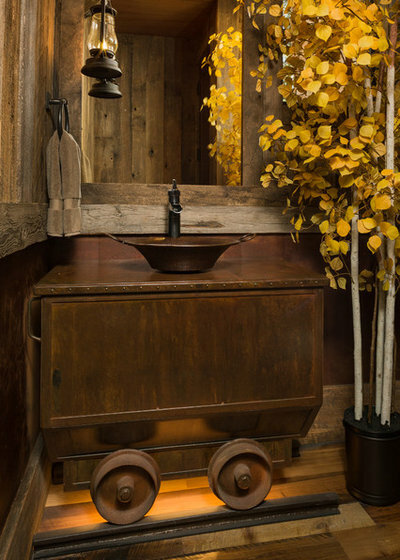 This rustic Colorado powder room features a vintage train cart transformed into a vanity that sits atop old train tracks. The space was built by Kogan Builders. 41. 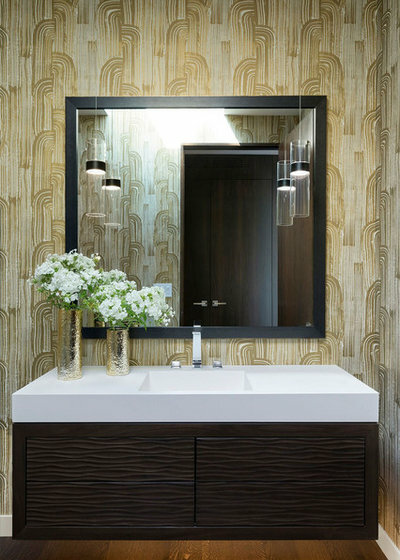 Stylish pendant lights flank the mirror in this hip San Francisco powder room designed by IDF Studio. Note the fun dog-inspired wallpaper too. 42. 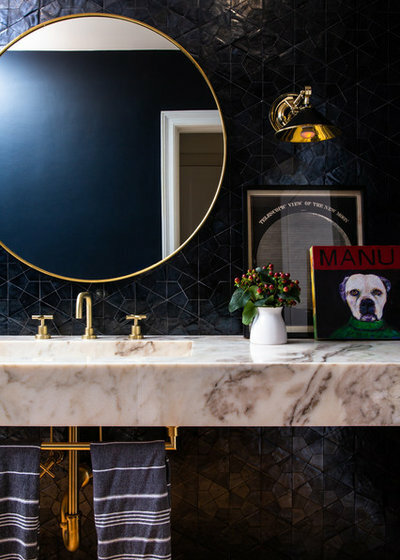 This London powder room is a homage to the beauty of marble. 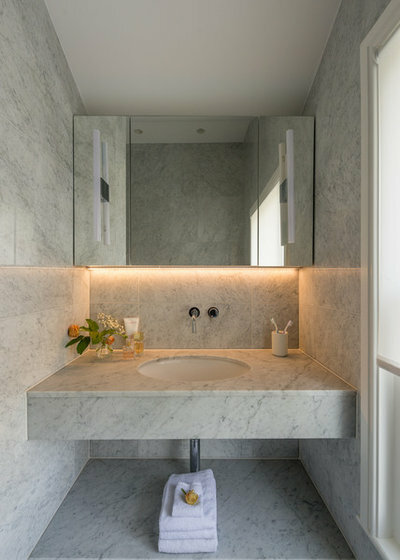 This lovely space, designed by rixon architecture, features gorgeous marble from floor to ceiling. 43. 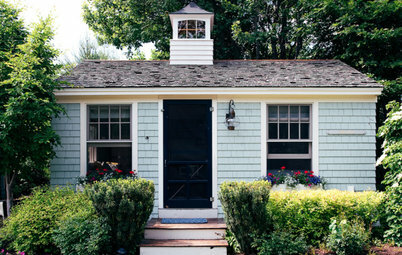 Cutting Edge Homes gave this Boston powder room a coastal vibe. 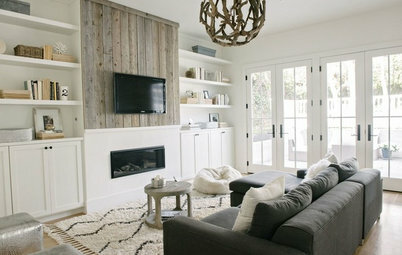 The space features sconces with sea grass shades, a distressed-wood vanity and white plank-covered walls. 44. A trio of glowing wall sconces stylishly balances the traditional silk wallcovering on the opposite wall in this powder room in Switzerland by I Love Colours Design Studio. 45. 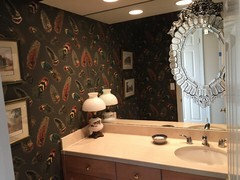 Beyond the stylish black fixtures and hardware and the whimsical wallpaper, note the two storage baskets at the bottom of the vanity. 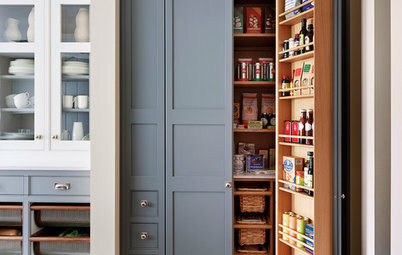 All of these elements make for a well-considered powder room designed by Chango & Co.
46. 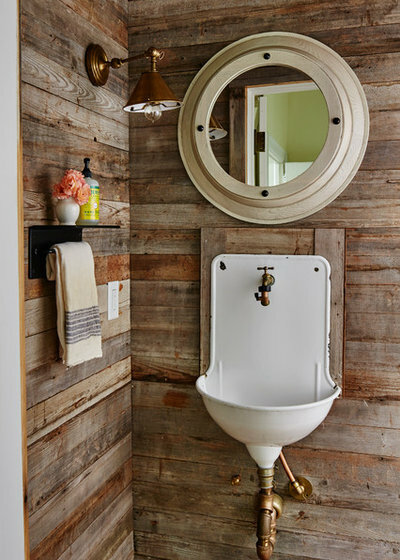 A porthole mirror, salvaged-wood walls and a vintage porcelain sink are among the highlights of this rustic powder room by Ashley Gilbreath Interior Design. 47. 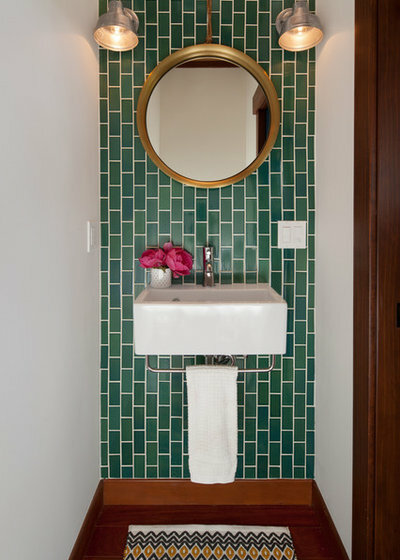 The design team at Yellow House ran the green subway tiles vertically along the back wall of this narrow San Francisco powder room. 48. 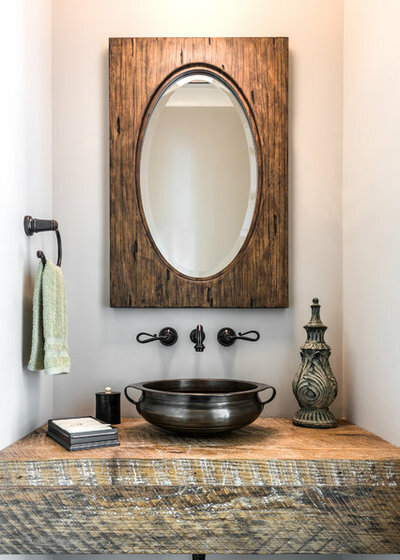 JMT Fine Living turned an architectural pedestal into a custom vanity here. 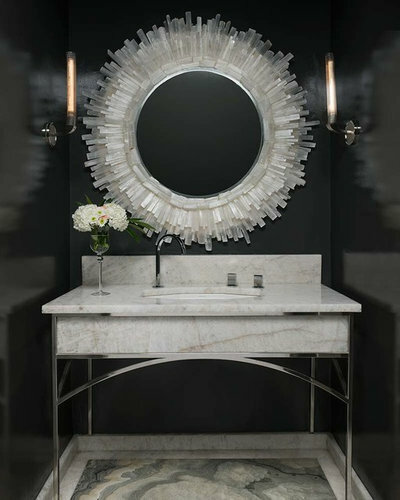 The white painted pedestal and white stone sink stand out against the dark backdrop. 49. 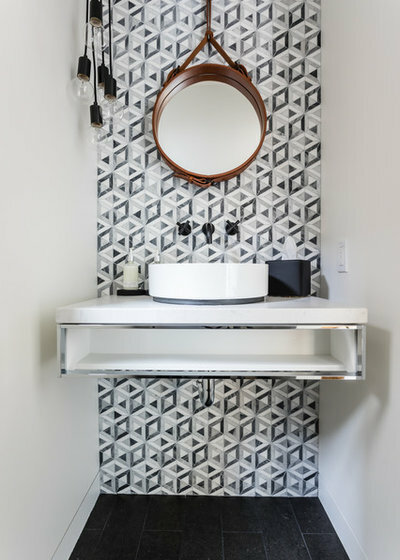 JMJ Studios combined a leather strap mirror, a cluster of exposed-bulb pendants and black-and-white tile lining the back wall to create a stylish San Francisco powder room. 50. Walls covered unevenly in gray hexagonal tiles give this Minneapolis powder room by Sustainable Nine Design + Build an artistic quality. What do you look for in a neighborhood? I love most of them but 31,40 and 48 are favorites. We did a partial redo a few years ago and will get a new vanity and sink later. Enjoyed all of the designs but #36 speaks to me! Great job Amy! 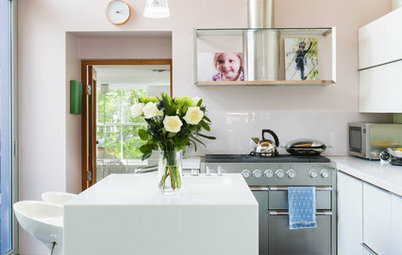 @casacerro - good start but you definitely need that new sink and vanity!